With the expectation of greatly enhanced user experience, 3D video is widely perceived as the next major advancement in video technology. In order to fulfil the expectation of enhanced user experience, 3D video calls for new technologies addressing efficient content creation, representation/coding, transmission and display. Emerging Technologies for 3D Video will deal with all aspects involved in 3D video systems and services, including content acquisition and creation, data representation and coding, transmission, view synthesis, rendering, display technologies, human perception of depth and quality assessment. 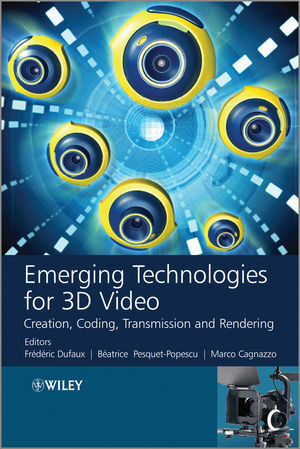 The book is a comprehensive guide to 3D video systems and services suitable for all those involved in this field, including engineers, practitioners, researchers as well as professors, graduate and undergraduate students, and managers making technological decisions about 3D video.